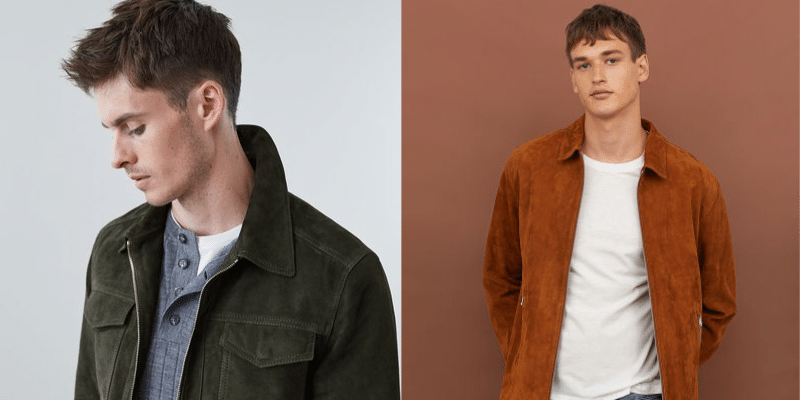 Granted, a men’s suede jacket might not be the most practical of items to have in ones wardrobe. But, there is no denying that it elevates an Autumnal look to Hollywood style icon level. It was a favourite of the likes of Steve McQueen in the bygone era of men’s style that we often look back at with rose tinted glasses. If it was good enough for the ‘King of Cool’, then surely it is worth your time. 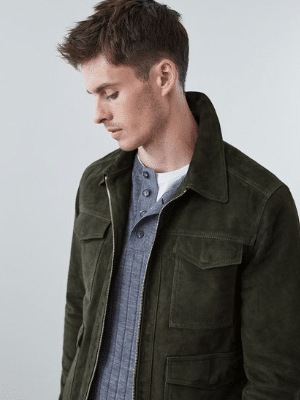 Be aware though, that it is also going to take a fair weight of dough as real suede often comes with a higher price tag than you might have normally invested on a jacket at this time of year. But, as a luxury pieces in your wardrobe it will serve you well, as this timeless jacket can be brought back out every year. Just make sure you take good care of it. The precarious nature of the material, means it will not take kindly to spilt drinks or rogue ketchup. Trying to get these stains out are going to be incredibly difficult so preparation is key. Apply a suede spray to add an extra level of protection before wear, For any unavoidable marks upon use, then grab yourself a suede brush and carefully brush with the natural path of the grain to help remove. 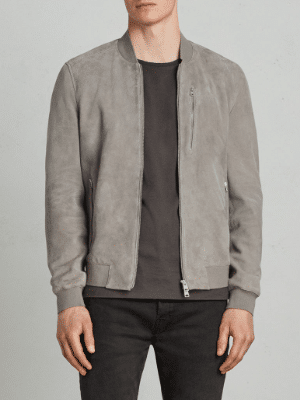 Probably the most popular style of suede jacket, this is also one of the easiest for men to pull off. 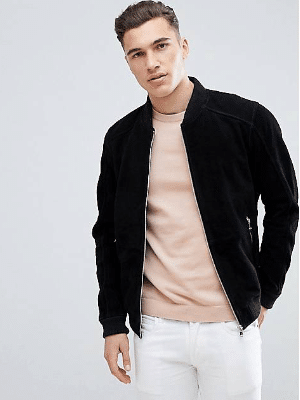 The bomber jacket came back to prominence with the influx of 90’s inspired pieces and don’t seem to be going anywhere. Using a new material like this can give your outfit a real edge. This outfit works best with simple, muted tones. 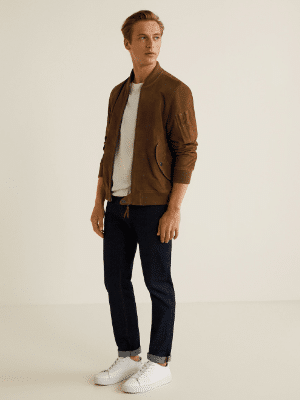 Let the jacket do the talking and pair with dark slim fit jeans or chinos and a basic colour top. I’m using a very generalised description to this, as slight iterations on the jacket can make it fall into numerous categories. 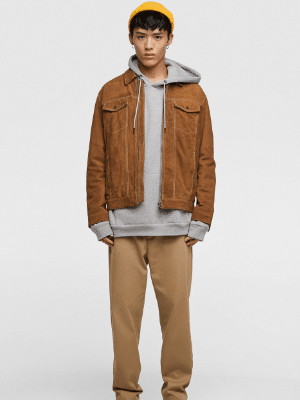 Add pockets and it becomes more like a field jacket or an overshirt for example. Just don’t mention the word shacket (shudders!) to me. 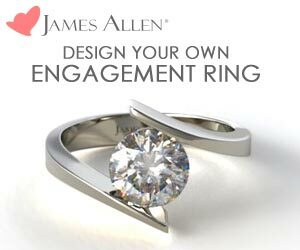 Because of its various incarnations it then becomes increasingly versatile. Dressed down with a hoodie (like Zara), or add a button down Oxford shirt and formal trousers for a smart casual look. 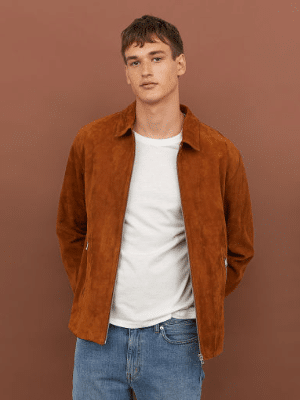 So, no matter what style of suede jacket you choose to go for, you can rest easy that it will be around for a long time to come.